View all the top donors here. Soros’ daughter, Andrea Soros, who now goes by her married name Andrea Soros Colombel, gave Planned Parenthood $250,000 in 2016. Her brother Jonathan Soros gave Planned Parenthood Votes $1,000,000. 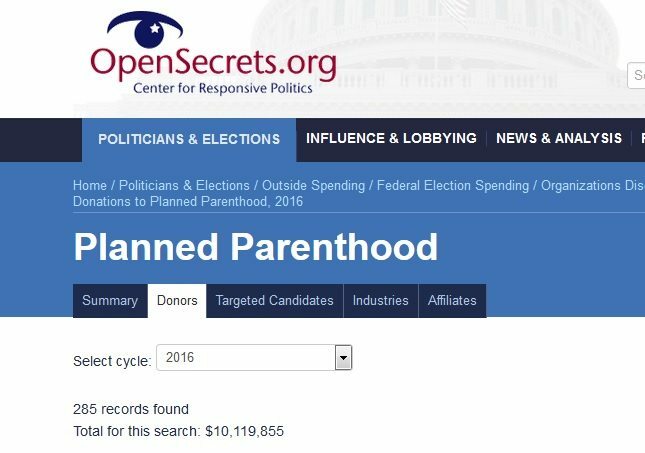 Soros daughter-in-law, Jennifer Allan Soros, is also among Planned Parenthood’s top political donors, giving them $1,000,000 this year. Jennifer also recently co-founded Give Lively with her husband Jonathan. But Jennifer Allan Soros has a relationship with Planned Parenthood which goes far beyond her financial support. 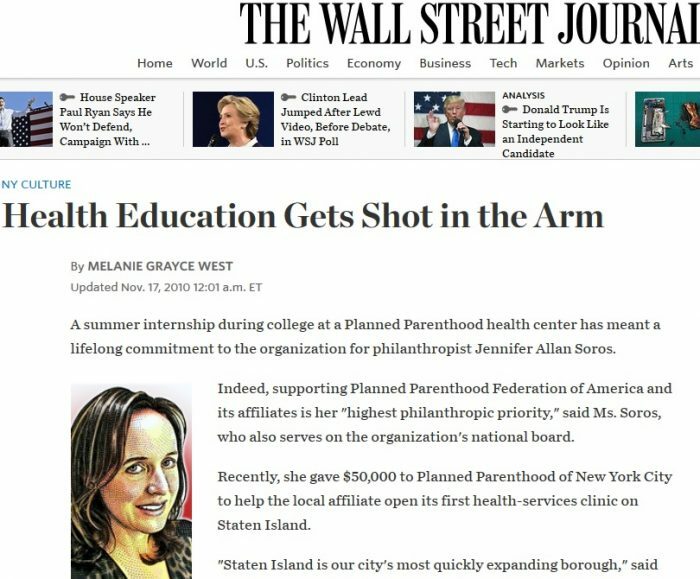 She began supporting Planned Parenthood during a summer internship in college, and told the Wall Street Journal that supporting Planned Parenthood Federation of America and its affiliates is her “highest philanthropic priority.” She recently gave Planned Parenthood of New York City $50,000 to open a center on Staten Island which will offer abortion referrals. 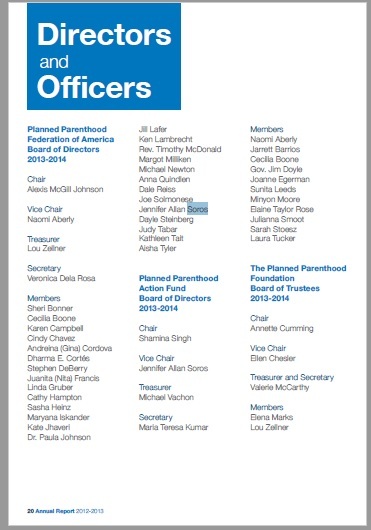 Beyond this, according to Planned Parenthood’s 2013-2014 Annual Report, Jennifer Allan Soros was listed as a Board Member of Planned Parenthood Federation of America (PPFA). She has also been listed as vice-chair of Planned Parenthood Action Fund as well as a member of The Planned Parenthood Foundation Board of Trustees. Ms. Soros has been on Planned Parenthood’s board for a number of years, as evidenced by their 2009, 2010-2011, and 2012-2013 annual reports. USP [US Program] is working with longtime grantee Planned Parenthood Federation of America, to determine how we might support c3-related efforts in response to the well-publicized attack on Planned Parenthood by the Center for Medical Progress. As of this writing, the funding of Planned Parenthood is expected to be at the center of federal budget battles, even though an end to that funding would mean that 630,000 women would be cut off from basic preventive services. While it is highly unlikely that the politics will allow an end to federal Medicaid funding, the long-term consequences involve the substantial eroding of Planned Parenthood’s credibility and reputation. (According to a recent NBC News/Wall Street Journal poll, Planned Parenthood is viewed positively by 45 percent of respondents—two points higher than the National Rifle Association, and well above any of the 2016 presidential candidates.) Planned Parenthood is mounting a vigorous defense, supported by a $1.5m OSPC grant, in the face of four Congressional investigations and a cyber-attack that closed its website (used by patients to get services), which required the hiring of security for many of its doctors, and otherwise distracted it from its core mission. Planned Parenthood as an organization commits more than 300,000 abortions annually, according to their annual report, and receives half a billion dollars in taxpayer dollars each year. While Planned Parenthood claims abortion is only 3 percent of the services they provide, the Washington Post gave the claim “three Pinocchios” and a detailed analysis from Live Action has also debunked the claim.